Now it is affordable and practical for anyone to duplicate Large numbers of USB flash drives for any application from Government use, to education to house of worship to Corporations (Marketing, Engineering, etc.) or individual home and office uses. We offer USB Duplicators from Nexcopy and Teac. Both brands offer exeptional value. Call us today to speak with a USB Duplcator specialist. 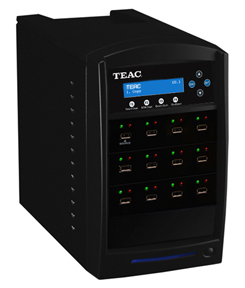 TEAC’s USB flash duplicators will copy, compare and erase up to 11 USB flash drives simultaneously. All functions are selectable via the duplicator controller with an LCD display, making it easier to control.